These grain-free chews offer a delicious mix of flavors, and if our picky pack’s reaction is any indication, your dog will likely love them. Given our success with feeding a limited ingredient diet to our very allergic Labrador retriever, I wanted to touch on another challenging aspect of dealing with dog allergies: choosing treats. We’ve been through the ringer in that regard. Finding snacks that won’t send your dog into an itching frenzy or cause breakouts, hot spots and digestive upset may sound easy, but if your dog is as reactive as ours you probably have the art of ingredient label study down to a science. One of our biggest struggles was with dental chews. We tried a few with varying, but disappointing results. 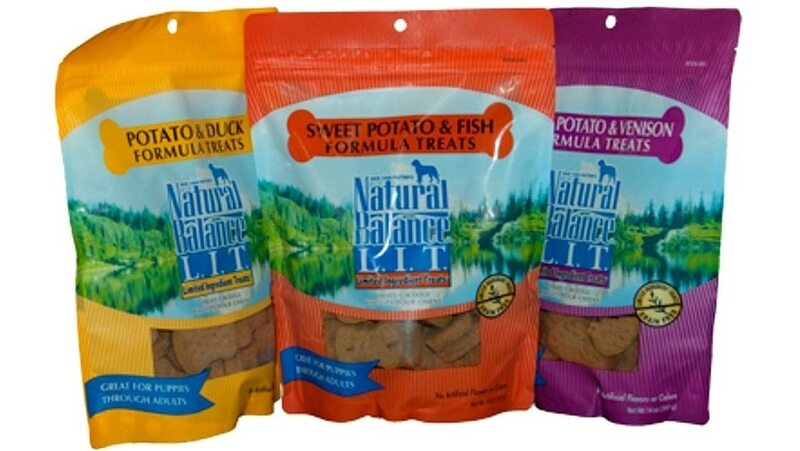 Natural Balance (our food sponsor) suggested that we try their L.I.T. 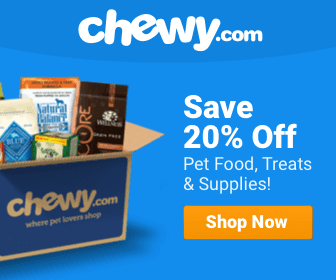 – limited ingredient treat dental chews. We were game, and a week later a package arrived that had our entire pack standing at attention. They watched with interest as bags of goodies spilled out of the box we opened. I was skeptical, because we have two very finicky eaters on our hands. Our lab ladies have turned their noses up at more treats than I can remember. But not on this day. Within a few minutes it was clear that we had a winner on our hands. The pack dispersed, and soon all that could be heard was the sound of crunching in unison. Not a scrap or crumb was left when they were done, and our allergic old girl finally had an answer for her need to chew without allergic flare-ups. We were psyched for her, and have been feeding her Natural Balance L.I.T. Sweet Potato & Chicken Meal Formula dental chews for well over a year now. Her teeth haven’t looked this good in years, so I think we’re on to something. L.I.T. dental chews help reduce plaque and tartar, are easy to digest, help freshen breath and feature vitamin C – a powerful antioxidant nutrient to support healthy immune function. They are scientifically formulated to support healthy teeth and gums by encouraging your dog’s natural chewing instinct. Made with a limited list of premium ingredients, these grain-free chews offer a delicious mix of flavors, and if our picky pack’s reaction is any indication, your dog will likely love them. February is National Pet Dental Health Month, so there has never been a better time to try them! 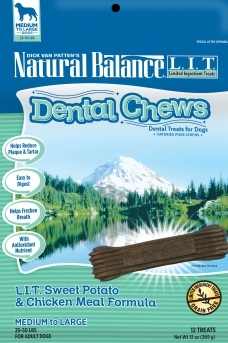 For more information about these, and other limited ingredient food and treats, visit http://www.naturalbalanceinc.com/dog-formulas/treats/dental-chews.